Good theatre, I think, is both a puzzle and a pleasure. A treat for the eyes, ears and heart – but also something layered, where the picking apart of each thread in a production leads only to more curiosity and wonder. To that end, Dominic Hill’s production of Cyrano de Bergerac is the theatrical equivalent of a delicious chocolate cake with a Rubik’s cube shoved in it. The year is 1640, and much like every other time prior to the 21st century, things aren’t going so great: the Spanish are acting up again, social conduct is bloodier than ever, and everyone seems to be talking in rhyming couplets. Enter Cyrano de Bergerac, a witty warrior and poet cursed with a face like a production of “Eyes Wide Shut” starring Pinocchio. Deeply in love with his cousin Roxanne but damned by his features, Cyrano soon finds himself helping another man win her heart with his words. Hi-jinks ensue. It seems prescient here to point out that the first thing that struck me about this performance was its language. The original verse drama becomes – in Edwin Morgan‘s lyrical translation – a mix of modern, light and heavy Scots and is wonderfully effective from the outset. I was surprised – as someone who is naturalised Scottish enough not to mispronounce “Cockburn” but who falters on “Kirkcaldy” every time – surprised that I was never confused. And make no mistake: this review could just as easily been a list of the cast from ensemble to music, with associated favourite lines and individual strengths. Part of the joy of this production (especially from a reviewing standpoint) is that the acting chain suffers no weak link. Keith Fleming’s pompous and yet strangely respectable portrayal of De Guiche and Jessica Hardwick’s firecracker rendition of Roxanne stood out as particular favourites, but that isn’t by much – each ensemble character could have acted alone on an empty stage, and I still would have paid to watch it. However, I would be remiss not to give extra praise to Brian Ferguson’s portrayal of Cyrano de Bergerac himself. And what a portrayal it is: the sting of heartbreak, the fever of victory and the occasional misery of acting morally – combine alchemy-like in Ferguson’s performance, which stands out as the most singularly believable portrayal of De Bergerac since Depardieu’s on screen. Whether duelling with steel or syllables, Ferguson not only succeeds in creating a character who is larger-than-life, but is also imbued with a vulnerable, raw kind of groundedness. The sheer energy and verve of Ferguson’s act is amplified even further by a director with a clear talent for the physical. Each group movement and mime is executed so expertly, it’s akin to watching a single organism twitch, undulate and react to its own dramatic movements. My theatre partner for the night, a stage combat instructor and enthusiast, had particular praise for the fights (especially in the first half, where rapiers abound). However, this is not a flawless production. Any criticisms, though, are minor in comparison to its strengths, and are mostly relegated to the second half, where accents occasionally slipped and lines of dialogue were directed to the back of the stage. It also proved a little difficult to see some of the beautiful physical accompaniments performed in the background of many scenes, owing to actors being swallowed up by the impressive scenery. A thought may also be given to the length of the show itself: the first act alone stretches to just under two hours. And whilst the production is of high enough quality that its length does not detract too much from the experience, I found myself hoping that it did not receive a deserved standing ovation for fear of my legs giving out for numbness. These moans do very little to muddy the sheen of care and talent which is buffed into every scene of Cyrano de Bergerac. This is a joint production that oozes the professionalism of Edinburgh’s Lyceum, Glasgow’s Citizens, and the National Theatre of Scotland. Its ability to mix what many might consider disparate ingredients into glorious, singular, drama cannot be understated. Just admire the dramatic polish! Give this one a watch while you still can. 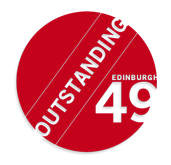 Visit Edinburgh49 at its Lyceum archive.